Last month, we reported on Sue Ede’s purchase of The Bath Decorative Antiques Fair from Robin Coleman, the Bath-based dealer who has organised the event for the past 23 years. 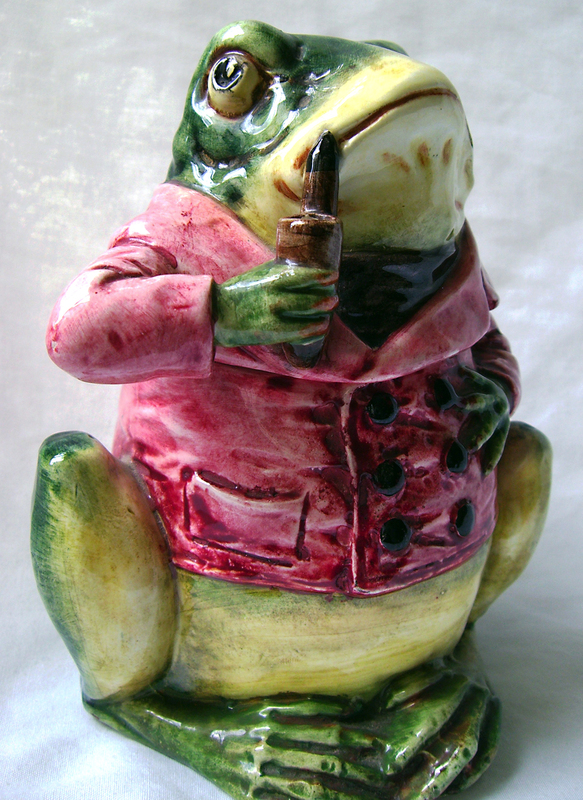 On the stand of new exhibitor Colin Brand Antiques at Westonbirt will be this majolica tobacco jar in the shape of a comical frog, c.1850, priced at £165. It's an area of the country that Somerset-based Sue knows well, as she already organises around eight giant flea markets a year at The Royal Bath & West Showground near Shepton Mallet. Also nearby, but at a much higher level than these markets, is Sue's The Cotswolds Decorative Antiques & Fine Art Fair near Tetbury, which is now over 20 years old and organised by Sue under her Cooper Antiques Fairs banner for the past ten. This event was rebranded to include the magic word 'decorative' a few years ago but, despite their similar titles, the Bath and the Cotswolds fairs will remain quite different animals, as Sue points out that Bath will stay an independent event with its own unique style and not be subsumed into the Cooper Fairs stable. But back to The Cotswolds Decorative Antiques & Fine Art Fair. The tri-annual event has its second edition of 2012 from August 17-19, as usual at the attractive venue of Westonbirt School, near Tetbury in Gloucestershire, set within scenic parkland and, of course, its own arboretum. In a central and affluent area, well known for its antiques, it's in an excellent location and the summer fixture benefits from being one of the very few UK fairs to be taking place in August. Consequently, the next event has grown from last year and has 48 exhibitors, spread around the central hall and rooms of Westonbirt School, a Grade I listed Elizabethan house which is now a strange but appealing mix of ornate painted plaster ceilings, carved wood panelling, institutional lino and games notices. Due to the expiry of the lease on her premises in Kensington Church Street, glass specialist Jeanette Hayhurst has recently relocated to Tetbury, just ten minutes away from Westonbirt, where she now has stock in Long Street Antiques. She is among the five new exhibitors at Westonbirt this year, with the remaining four being Colin Brand Antiques from nearby Stow-on-the-Wold (period furniture and collectables); HD Asian Art of West Yorkshire; J.C. Antiques of North Yorkshire (town and country period furniture, metalwork, clocks and pictures) and Cooper Fairs regulars Balmain Antiques from Cleveland, dealers in art and sculpture. There is a broad range across the regular exhibitors, with eight specialists in period furniture this time including John Collins & Son from Devon, In Vogue from Surrey and Mark Seabrook from Cambridgeshire. There are not that many specifically 'decorative' dealers per se, but those with a quirky bent to appeal to the home furnisher include Something Different from Somerset, with a mix of unusual art and antiques, and Paul Burnett of Gloucestershire with vintage furnishing, while Bristol-based interior designer Stephanie Fisher of Eclectique Interiors is also taking a stand. But art dealers are more plentiful, with Modern and Contemporary dealers including Callaghan Fine Paintings from Shrewsbury; West Midlands-based Orangehat Contemporary Art and Ceramics with pictures by Ruskin and the St Ives School and ceramics from the Winchcombe pottery, Troika and Carn, and Price Davies Art from London with Modern British works. Meanwhile, Ryland Fine Art from East Yorkshire offer 18th and 19th century pictures and Aquila Fine Art of Buckinghamshire have watercolours and etchings from the late 19th to mid 20th century. Among those with smaller cabinet pieces are scent bottle and continental glass specialist Richard Hoppé from Devon; London silver dealers Stephen Kalms and Malka Levine; David Scriven Antiques from Gloucestershire with British pottery and porcelain from 1750 to 1850; jewellers Scarab and Plaza, and Parkstile Antiques of Lincolnshire with silver and glass.